I had been getting my reads from Amazon before. They offer a huge selection and reasonable prices, but their shipping costs were huge. I’m sure they’re smaller in the UK or US, but the delivery to Lithuania had cost me as much as the books themselves! (Amazon charges both per-package and per-item, basically doubling the cost). Besides, the package used to take more than two weeks to reach me. This is where I started looking for an alternative, and The Book Depository caught my eye due to their advertised “free worldwide delivery”. After buying and receiving my first order from them, I said goodbye to Amazon and their overpriced international shipping! 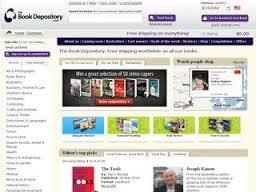 The Book Depository is the UK’s largest dedicated online bookseller, offering the largest range of titles in the world, available for dispatch within 48 hours. Founded in 2004 to make ‘All Books available to All’ they focus on selling ‘less of more’ rather than ‘more of less’, differentiating themselves from other retailers who increasingly focus on bestsellers. Free worldwide shipping: only pay for your book, no matter which country you live in. Forget overpriced delivery charges! Competitive prices: Amazon and BookDepository usually offer similar prices. That means buying from BD is cheaper, since Amazon will also charge additional money for shipping. Only in very rare cases where Amazon book price + shipping costs are less than BookDepository book price, I’d order from Amazon. Fast delivery: interestingly enough, TheBookDepository packages usually reach me in a few days, while Amazon parcels used to take 2 weeks – despite BD offering free shipping and Amazon charging unreasonable amounts for it! Go figure. PayPal support: this is a big one! Amazon only lets me pay with my credit card, while BD allows me to use PayPal, which is much more convenient and secure. What other Customers are Saying? I have been a loyal Amazon Customer for a number of years, mistakenly believing they offered the best price (and with free shipping on a $25.00 purchase), the best all around bargain. I have since discovered THE BOOK DEPOSITORY through one of Jewel’s earlier posts. Just for the heck of it- I searched their database for THE HIGHEST STAKES and found they offer the lowest price I have yet seen $10.31 (list is $15.95)AND free shipping worldwide! What a bargain! I purchased 2 books, and one of them was a 45 day wait, because I pre-ordered it before the publication was on the shelf. I also ordered my grandson the Dr. Seuss ABC cards. The cards and one of the books arrived 4 days before promised, and in perfect conditon. The pre-ordered book also came earlier than expected in perfect conditon, as well. This was my first experience with the Book Depository, and I was extremely satisfied with the delivery service, and the condition of the products. They have a wide selection of titles to choose from, and have very competive prices. As far as I am concerned the Book Depository rocks it! I will be a repeat customer. Ordered from Book-depository because Amazon doesn’t accept pay-pal. Price was quite good (bought two of the Andrew Loomis books. A long dream come true) and delivery-time was set at 7-10 work days, which I figured shouldn’t be a problem. Ordered on April 11. Book 1 was dispatched on April 12. Book 2 on April 14. Books in Australia are ridiculously expensive. Shipping to Australia is also very costly – we are a long way from anywhere. If you are prepared to wait a few weeks, Book Depository are just about the cheapest place to get books; far cheaper (in general) than the company that now owns them, Amazon. I just checked and I have placed 29 orders with them so far, and had no problems. They often have both US and UK versions of a book, so be careful if localised language matters to you.